Results: 60/40 on dumping it. OK - I hear you but let me tell you my dilemma and how hard it is for me. 3. Pastor Skender, who thought I was perfectly Biblically sound when I taught at the Four Square convention in Switzerland left a comment yesterday where he thinks I am now a heretic because I support the "emerging church". I have responded to him that Four Square in Europe has some good examples of emerging church but thats a another vote in favor of losing the word. 4. Tony Jones defines "emergent" as "specifically referring to the relational network known as . 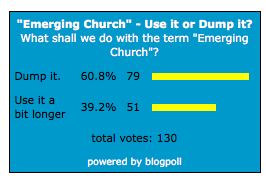 . . Emergent Village" (in his book The New Christians) and since our ministry and the ministries we support are not officially part of Emergent Village, I can no longer use that word honestly, despite the word's usage over the past 30 years. 1. Phyllis Tickle's book The Great Emergence is coming out any day and its a fantastic history of the last 40 years of The Emerging Church. Be a shame to throw a wet blanket on it. "Emerging Church’ and ‘Emerging Ministries’ are about reaching out to others in ways they can relate to. It is about the church adapting in order to speak to the cultures round about. Our society is diverse and fragmented, and if we are to fulfil the church’smission in sharing the Gospel, we need to be a people who are prepared to incarnate the Gospel in the many and various expressions of contemporary culture. Such adaptation and innovative risk-taking finds roots in our Reformed tradition – “reformed and always reforming” (reformata semper reformanda). Most people are familiar with the traditional Parish model of church life, but there is no single model of church and Christian communities have always taken a variety of forms."